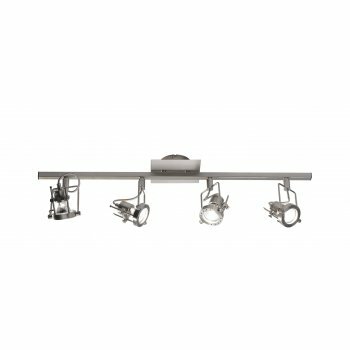 Dar Lighting Bauhaus halogen spotlight fitting 4 light ceiling fitting features a rectangular design ceiling plate with 4 adjustable lamp heads attached to a ceiling bar all in a satin chrome finish. The product code for this Dar ceiling fitting is BAU8446. There is a 3 light ceiling fitting and a single light wall fitting also available in this range.